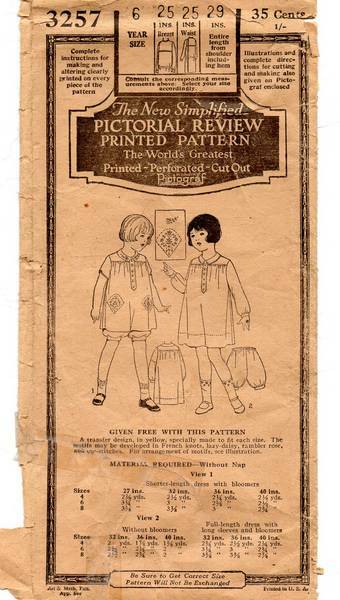 Rare Pictorial Review pattern and Pictograf for girls' dress and bloomers. Front and back of dress are gathered to a square yoke. Dress is closed in from through the bands which are attached to the opening. Collar at neckline. Long sleeves gathered to wristbands or short sleeves. 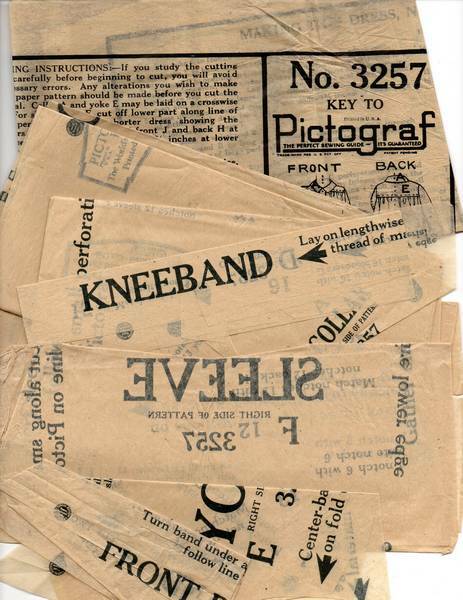 Bloomers are gathered at lowere edges to knee bands; elastic is inserted through the hem at upper edge. Size 6 Years; Breast 25; Waist 25. Pattern is complete. The tissue pattern pieces are in amazing, well preserved condition. The pictograf (tissue sheet with illustrations and instructions) is also in well preserved condition. All of the pieces are very supple and have very little age toning. The envelope has not aged as well and it is age toned and fragile. Several tears; older tape mends and cracking to edges, as shown. All of our vintage sewing patterns are stored in archival quality, acid free backing boards and resealable polypropylene envelopes. This pattern will be shipped to you enclosed in its archival envelope and backing board.